Yesterday I watched Harlan Ellison: Dreams with Sharp Teeth on DVD. The movie is a documentary of the gentleman's life and features face time with Robin Williams and Neil Gaiman and Peter David. Hearing Mr. Ellison ranting in this film reminds me of the convention appearances I saw of the writer a couple of decades ago, and I enjoyed those appearances very much. I won't label Dreams with Sharp Teeth as a perfect movie but I'm glad I saw it. 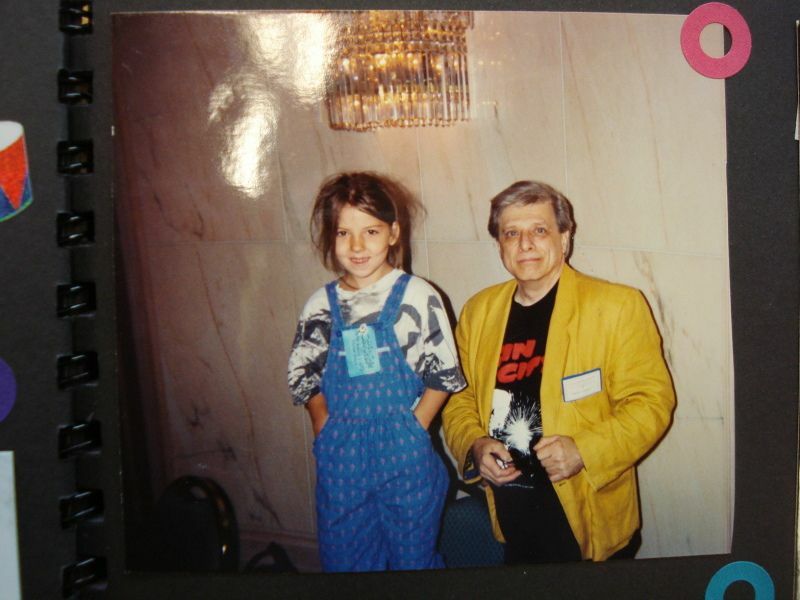 Maybe you'd like to reread something else I wrote about Harlan Ellison and, from last summer, here it is. Yes, I headed that article with the same photo that you see at the top of this page. This marks the first time The Hayfamzone Blog has used the same picture a second time but that photo I snapped is priceless to me and it's entirely possible that I will reprint it a thousand more times! 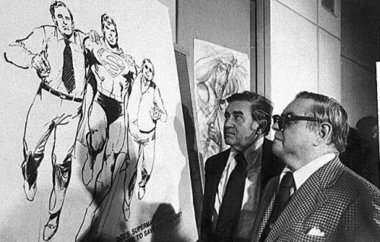 Jerry Siegel and Joe Shuster admiring a Neal Adams drawing of Superman flying with the two of them. Last week I shared with you a link to a 6-minute audio clip of Jerry Siegel appearing on the Fred Allen radio program in 1940. Well that was nice of me, but it was just the first six minutes of a longer appearance and a lady kept whispering "preview" every 30 seconds or so. That clip was the best I could garner at the time but I now have a greatly improved option for you. I have found a podcast which features the full Jerry Siegel appearance, plus you additionally get to hear DC Comics publisher Harry Donenfeld getting mouthy with Superman (as played by Clayton Collyer)! The podcast host begins the transmission with a bit of his own organizational business but, after that, it's smooth sailing with what Mr. Siegel and Mr. Donenfeld and a (gulp) testy Superman had to say. You can listen to this great piece of history over here. Enjoy! A few years back when Smallville was soaring high for the CW, that network went looking for ways to make their superhero-coming-of-age lightning strike twice. In 2006 they ordered a pilot for a television series featuring a young Aquaman before he knew the extent and origin of his powers. In the title role was Justin Hartley (who subsequently went on to portray Oliver Queen/Green Arrow in 72 episodes of Smallville), and a helpful merman from Atlantis was played by Ving Rhames. The full pilot was filmed and is available for purchase on iTunes, but for no charge you can view an intriguing trailer for the show by clicking above. It looks good to me and I think I would have liked this Aquaman show. Eaglemoss Ltd is the company that I recently told you is producing sharp little collectible Batmobiles of every stripe, and now I find out that they also manufacture collectible chess pieces modeled after Batman and his friends and foes. Yes, there is also a Batman chessboard. 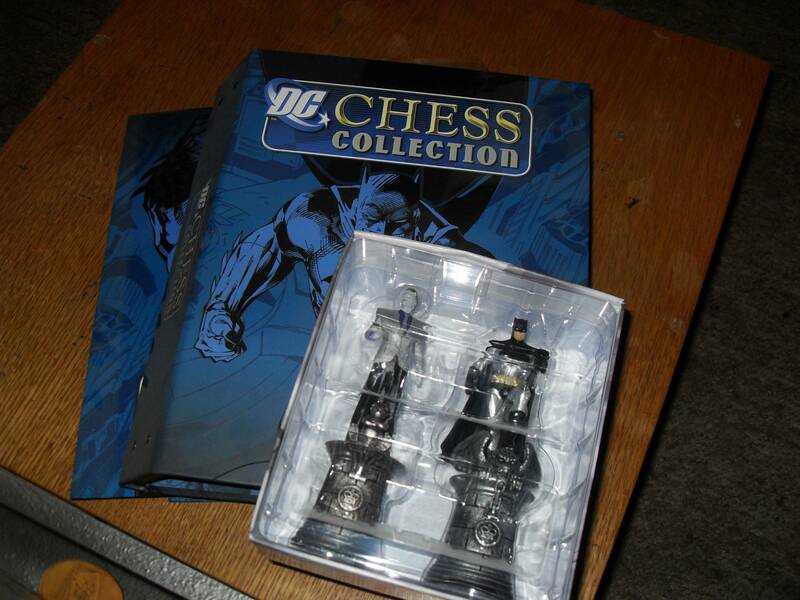 Like the Batmobiles these chess pieces also look very nice. Eaglemoss would be wise to set up a presence beyond the shores of Great Britain because it seems to me that they are missing out on a great many willing-but-unaware potential customers. Here is more information from the Eaglemoss website and, hey, let's look and see if any of the pieces are available currently on ebay. I am unable to find an audio clip of that radio commercial to share with you, but here is a YouTube video of a fellow fan paging through the issue to show it to us. As for the comic itself, it's okay. I like Jeph Loeb as a writer and I also like Ed McGuinness as an artist but, if you say the phrase "Nova #1" to me my mind will drift back to the fun John Buscema comic book from 1976. Pretty much the entire Marvel Now initiative has left me unimpressed. I purchased a number of the various first issues and found nothing engaging enough to bring me back to the trough for the second issues. I am constantly on the lookout for great new comics and I will be sure to tell you every time I find one. Do you know that one episode of the PBS series Pioneers of Television focused specifically on live-action TV programs that feature superheroes? Of course it all started with Superman in the 1950s, then Batman in the 1960s, and Wonder Woman and The Hulk in the 1970s, and so many after that. The Pioneers show is very well produced and features new interviews with Adam West and Lynda Carter and other stars of the above-named shows. You can watch the full episode over at this website, and they also have videos entitled "Wonder Woman, Everyone's Superhero" and "Dangerous Stunts on Batman." Enjoy! I keep my eyes open when I'm driving around the great city of Chicago, and of course my eyes grew wide when I saw a sign telling me the location of The Original Bat Cave! Who wouldn't want to convene a party in the Bat Cave?! 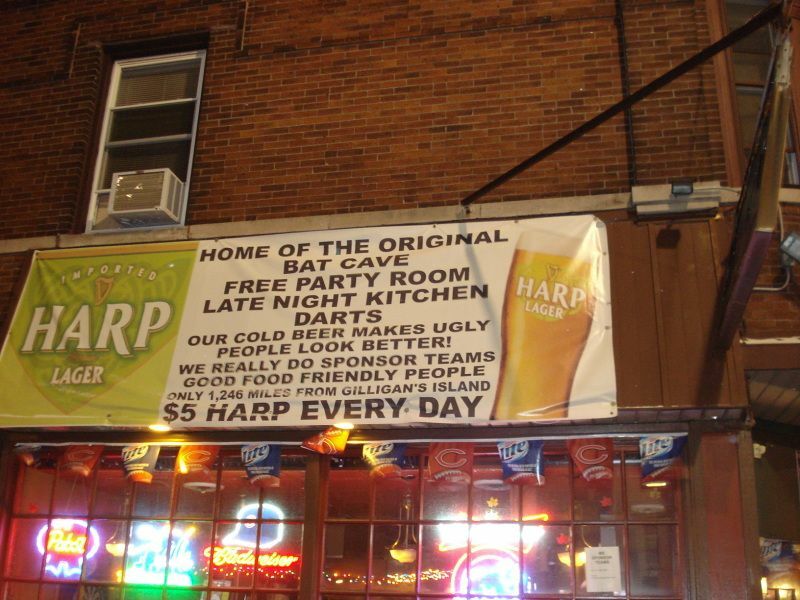 I went into the establishment and asked the bartender if I could please see his Bat Cave. He wasn't sure what I was so enthusiastic about as he took me around the corner to a medium-sized room with nothing in it but an empty stage. That, of course, was not exactly what I had been hoping for. I thanked the gentleman and exited. If you're curious to see this Bat Cave for yourself, it's located inside The Windy City Inn at 2257 West Irving Park Road. Keep in mind that will need to supply your own bats. 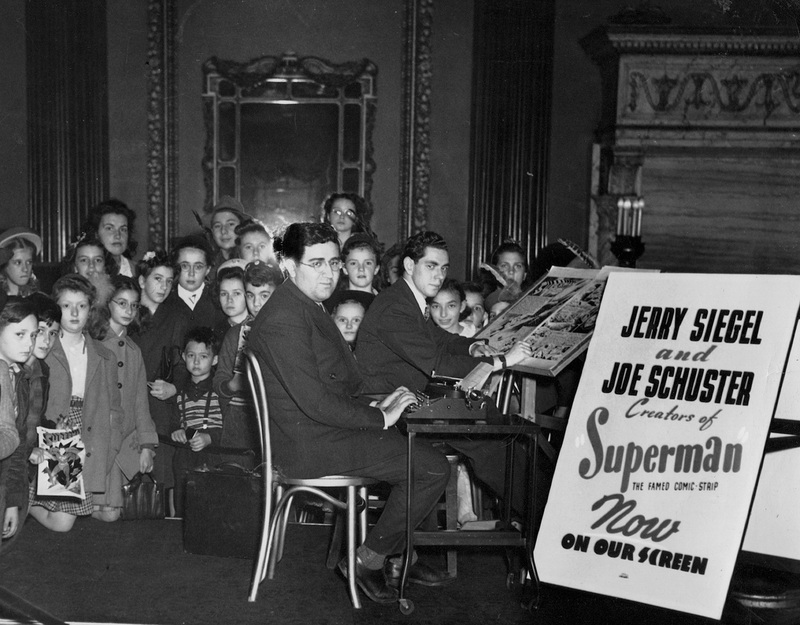 Of course when I say "Jerry Siegel" you think of the writer who co-created Superman with artist Joe Shuster. But do you know that the gentleman appeared on an episode of a popular radio show in 1940? It's true. I've told you previously that comic book writer Steve Darnall also hosts a weekly Old-Time-Radio show. I happened to be listening to his show this past Saturday and no sooner did I tune in than I was treated to a recording of Mr. Fred Allen interviewing Mr. Jerry Siegel on the 10/9/1940 installment of The Fred Allen Show. If you were to ask me who Fred Allen was I would tell you he was a comedian who had a friendly rivalry with Jack Benny, but if you then asked me who Jack Benny was I would probably say never mind. To hear a six minute sample of the 1940 interview, just click here and the recording will begin playing immediately. UPDATE: I found a better way to listen to the above audio plus a couple more great photos. Here you go. Well, Comic Book Men returned last week with new episodes. They've changed the day and time that it is broadcast and their new schedule does not at all fit into my schedule. As often as I've written about the show you'd think they would have called to ask my opinion about a new time slot, but they didn't. I managed to catch the last possible replay and I'm here to tell you that my comments about Comic Book Men are the same as they were last seasn. Don't get me started.What I said over here applies perfectly well to the newest episode. Kevin Smith as the emcee of a televised comic book hootenanny seems to pander to the lowest common denominator. Kevin Smith as a podcast interviewer is a whole different kettle of fish. I have listened to Part I of a freewheeling and uncensored interview with Grant Morrison and this is more to my liking. I suppose that Mr. Smith is worried that featuring on television a truly comics-centric talk with one of the best comic book writers might scare away whoever is watching and liking his insipid Comic Book Men, but I wish he had the will to uplift and inform his AMC audience rather than just milk it. You can listen to the great Grant Morrison interview over here. Last summer I told you about Black Kirby. The great artwork of John Jennings seems to me like a marriage of the styles of Jack Kirby and Philippe Druillet and I like it quite a bit. The beautiful artwork is on display for the month of February in The Illini Union building of The University of Illinois and I would recommend any fan of comic art who will be in or around Champaign-Urbana to get over to see the exhibition. Here is a video with more background about the project. Like the poster below states, we're all in search of the Mother Boxx Connection. The artwork of Steve Ditko is a treasure that comic book fans appreciate. 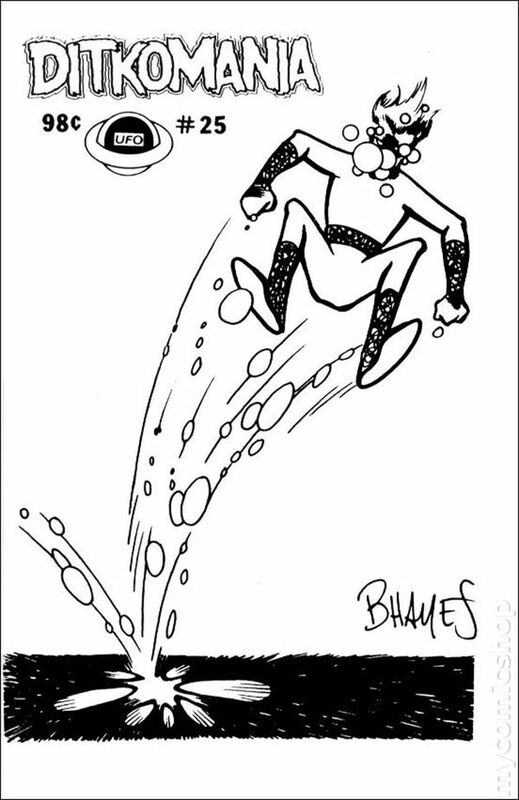 To spread the word, Ditko fan supreme Bill Hall published Ditkomania #1 way back in 1983; I feel a strong connection to the fanzine because I have been collecting it and submitting drawings to it since 1984. The publishing reins passed to Rob Imes in 2008, and I've written previously about how sharp the publication has looked under Rob's direction. Rob was putting out the issues with amazing regularity, until recently. For financial reasons, the time between the release of consecutive issues has increased. This week Rob announced not that he is giving up the endeavor, far from it! Instead he has started a Ditkomania Kickstarter campaign to raise funds to help pay for the publication of the next issue. Rob may also run a Kickstarter for successive issues and I salute his tenacity. You can view the Kickstarter Video for Ditkomania #90 right over here. No, I'm not talking about Before Watchmen. I'm talking about Watchmen. 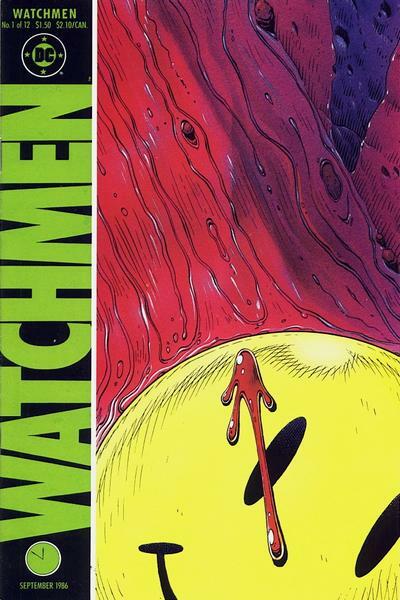 One time I showed you a little-remembered Dave Gibbons Watchmen poster, but guess what? As I write this, the 1986 cover artwork to Watchmen #1 is up for bid at Heritage Auctions! The current bid is at $40,000 and the auction is expected to top out around (gulp) $100,000. While it lasts, here is a link to the auction page. Good luck to each of you who is placing a bid! The artwork sold today with a high bid 0f $130,000! The winning bidder will be paying a total of $155,000 because Heritage Auctions adds a percent-based Buyer's Premium to the winning bid. Whew! There is a great deal of fun energy in this three minute Batman and Robin video from a couple of decades ago. It's right over here. And you can read about the 1991 movie from which the clip is extracted over here. Thanks to Mark Millar sharing this so I could share it with you! The Justice League stories that Brad Meltzer wrote in 2006 and 2007 were my favorites in that series since the run of Steve Englehart back in the late 1970s. Mr. Meltzer is a very successful novelist these days and a live promotional appearance of the gentleman at a bookstore was videotaped and recently aired on C-Span2/BookTV. You can see the tape for yourself if you go to this link and click on the WATCH button. Mr. Meltzer tweeted that the question-and-answer portion of his appearance was particularly wonderful, and I agree. I mean to introduce you to some of my fellow comicbloggers every once in a while and hopefully I will do so in a more timely manner in the future. The gent I'm telling you about today published his final article in 2009. 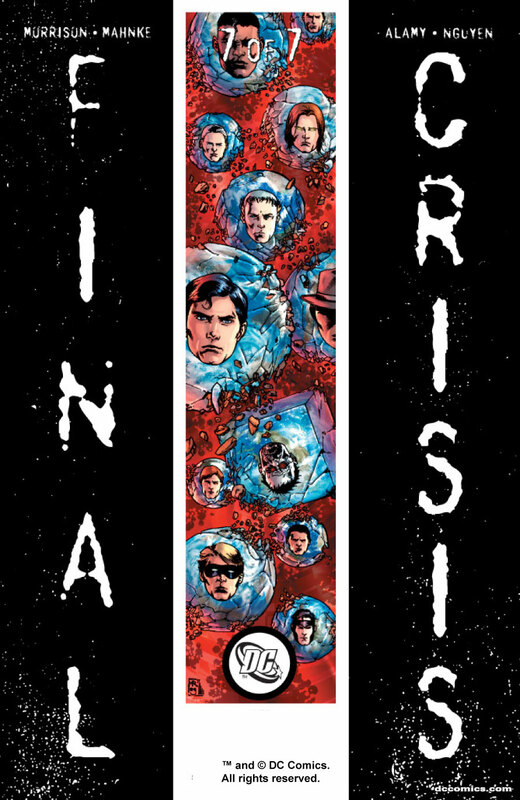 Marc Singer is a big fan of Grant Morrison but found Final Crisis disappointing. I concur. Mr. Morrison and Geoff Johns are my favorite two writers of monthly comics but I definitely do not like everything that either one writes. Mr. Singer also delves into the philosophy of comicblogging at the end of his farewell piece and that's what I found most interesting in the article. See for yourself over here. At the time the comics news outlets made it sound like Jodi Picoult would be writing Wonder Woman for a long time to come, but after a five-month story she was gone. Ms. Picoult before that was and since then has been a novelist of some renown. There was a one-page interview with the lady in today's New York Times Magazine, and I read it to see if Wonder Woman would get mentioned. The answer is no, although on one of her Twitter pages Ms. Picoult refers to herself as Wonder Woman. Hmmmmm. 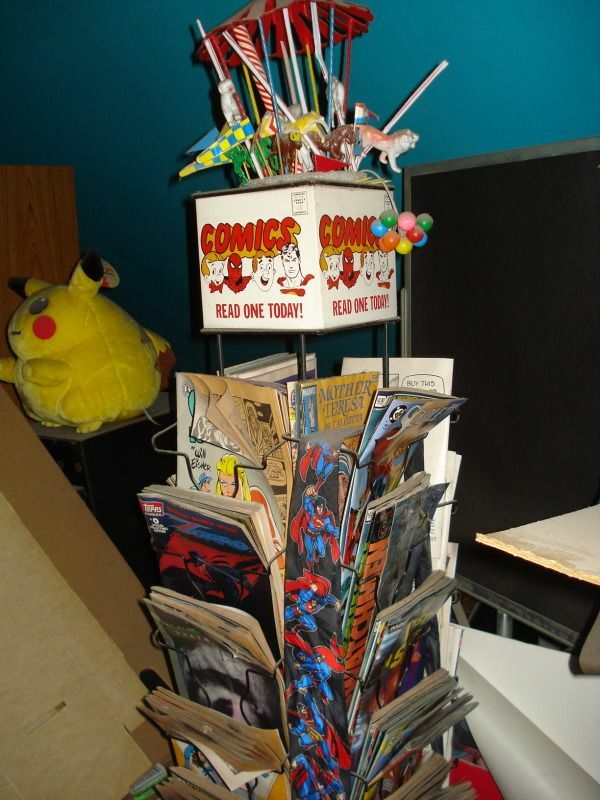 It is my pleasure to be able to report that I own a comic book spinner rack. I always wanted one when I was a kid! I bought it directly from the manufacturer in the late 1980s. You can see above that it's stocked with an issue of The Spirit and there's a Watchmen and (though not visible in the photo) I keep a Forever People #1 in there, and many other comics. And that's a Superman necktie hanging on there. You can also see in the photo that the comics look a little raggedy and bent out of shape. 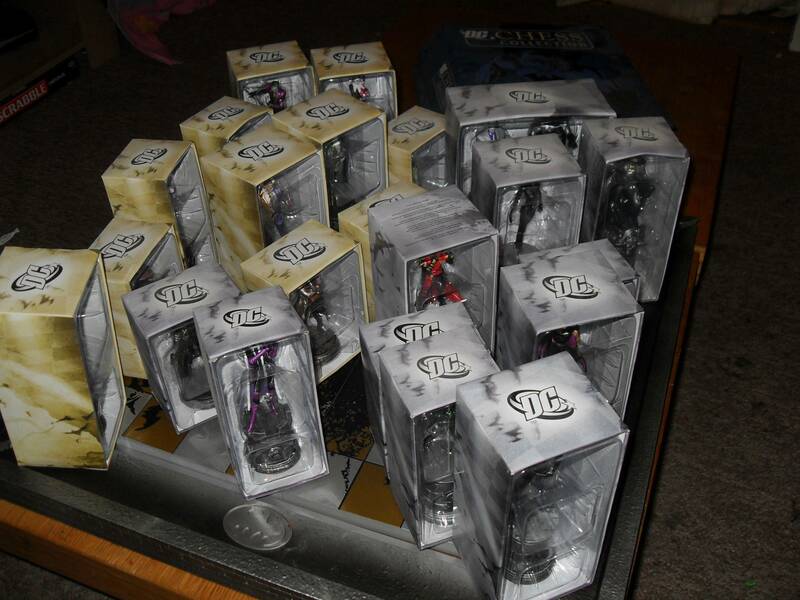 They were in perfect condition when I first placed them in there, but gravity has taken its toll. I suppose I could bag each comic with a backing board but (ha ha, you know I hate Comiclink and) I'm not about to do that. I also could have artificially spruced things up and stocked the rack with a whole new batch of comics before snapping the photo, but I didn't do that either. Keeping it real in The Hayfamzone, keeping it real. Back here I told you how you could make your iPhone look like a Mother Box. Jack Kirby would get a real kick out of that. But now there's even more! Over on twitter you can follow @Mother_Box. That's right, you can receive calming messages from this wonderfully intuitive machine. She has put out over 10,000 tweets! Down below are some representative samples of the messages she sends, and you know that Mr. Kirby also would get a charge out of these! The Hayfamzone Blog is about comic books, right? Right. So I try to tie everything in with comics whenever I can. Well, fasten your seat belt for the next paragraph. The superb Batman movies of 1989 and 1992 were directed by Tim Burton who also directed 1985's excellent Pee-Wee's Big Adventure, and Pee-Wee's Playhouse on the small screen a couple of years later featured music by Devo headman Mark Mothersbaugh, who just happens to be the gentleman responsible for the music in the current HBO series Enlightened. Whew! As I get older I find myself drawn to stories of individuals looking to find their place in the universe and wanting to leave a significant mark on that universe. Enlightened is about exactly these two things. Every episode is written by Mike White, whose genius I recognized as I sat watching his Chuck and Buck back in the year 2000. That's him in the white shirt up above. The ending of the Enlightened episode entitled "Not Good Enough Mothers" had me smiling and crying simultaneously, if you can imagine such a thing. We have here some brilliant writing and I am looking forward to seeing much more of these great characters on this wonderful show. I salute you, Mike White. 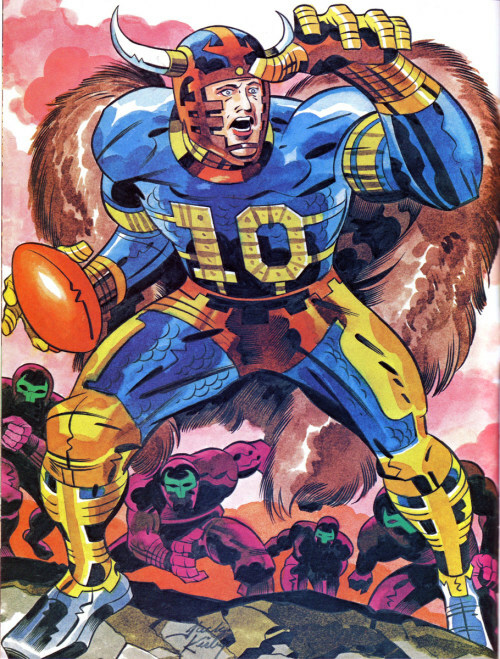 In honor of the Super Bowl, here is a 1975 painting of quarterback Fran Tarkenton that Mr. Jack Kirby drew for the NFL's Pro! Magazine. My thanks to The Kirby Museum for sharing a drawing I had never seen before, and there are more such drawings to investigate in the Museum's exhibit of Kirby's Real Folks. Apparently John Byrne derives a large percentage of his income these days from art commissions like the one above. 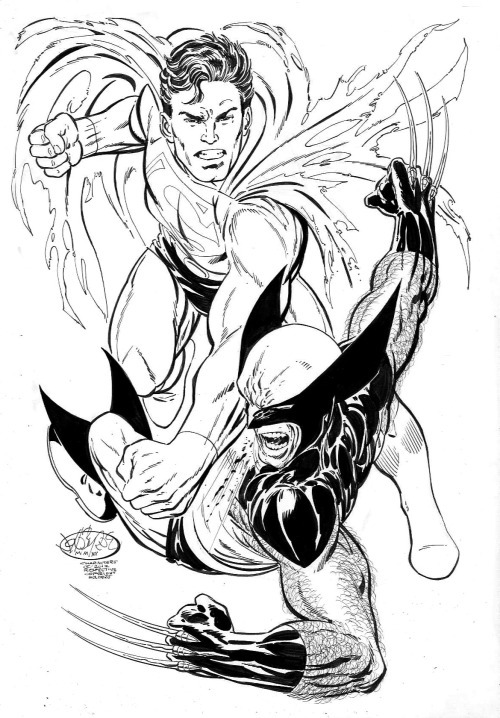 Also I understand that Mr. Byrne has retired from all convention appearances, his last one being Mid-Ohio Con in 2004; he felt that the appearances took away from his drawing time and did not increase the sales of his comics.